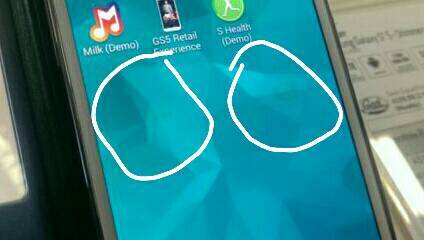 Ok, at Best Buy today contemplating the S5 and while playing with the demo model I noticed this (photos below) screen burn in. It's from the special case that allows you to check phone status without opening phone. Immediately I was very discouraged and put off of even considering this phone if this can happen. I have never noticed any burn in with my S3 but didn't they change the screen with this model? 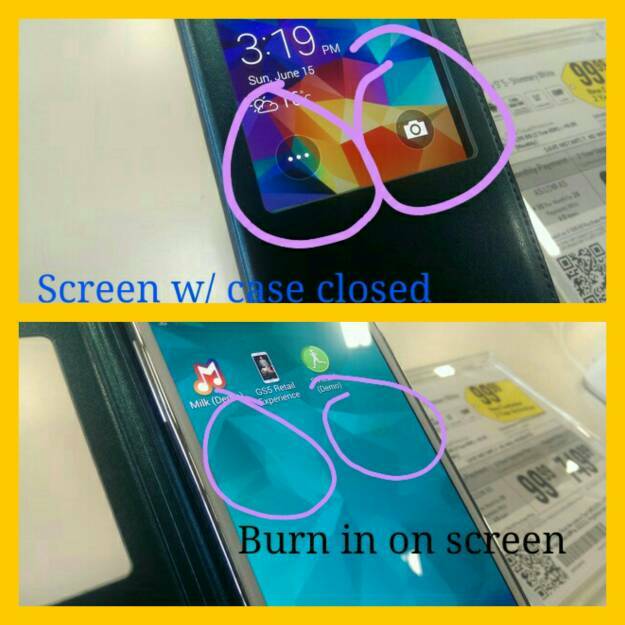 Have any of you S5 owners experienced this screen burn in? Granted, it's a demo model and used a lot but if this case causes burn in how easy is it to "burn in" a home screen if you didn't change your icon placement often...? Hmmmm, worth thinking twice before buying I think! It can probably happen with those demo units because they are on the entire time the store is open. It definitely doesn't represent normal use. I've never had it happen with mine. Had it since April. It's a demo unit and it happens alot to them. You won't have anything to worry about. The phone is on literally 24/7, demo devices are jammed with so much crap and are pushed to the limit. Let's face it, even though the staff is supposed to turn off the device. It's never done. It's not that the screen's on a lot, it's that it would have to be on the same screen for a long time. Sorry, maybe it's me but I don't see (on a brandnew MacBook Air 13 screen) that supposed burn-in on your posted photos. But assuming it's there I can't get my head around a store manager leaving demo models like that on display. Reason for demotion, imo. I certainly wouldn't buy from that place anymore. I have a new MacBook Pro 13" and I see it quite clearly, without the need to zoom. This is something you definitely don't need to be concerned with as a consumer. It often happens to demo models that are left on the same screen for extended periods of time on a regular basis. I saw a Galaxy Nexus at a corporate Verizon store that had it much worse than this, to the point that it greatly hindered usage, yet it was still on display. Why that unit hadn't been replaced by then is beyond my understanding. I had an actual Galaxy Nexus and the burn-in was terrible. I didn't leave it on 24/7, but it didn't matter. The navigation bars, status bars and various parts of other apps I would commonly have open burned in to the screen, and no amount of screen fixer runtime would fix it. This was within six months, by the way...not by the end of its run. It is a shame that fewer and fewer manufacturers are using LCD panels, because it was enough to put me off ever buying another AMOLED device again. What size case or screen protector for Galaxy Light? S5- How do I stop the screen from activating when a text is received? How do you get a PDF to open in browser?